Nov3 by John M. Buol Jr.
My last active duty assignment as a small arms trainer took place at Fort Sill. 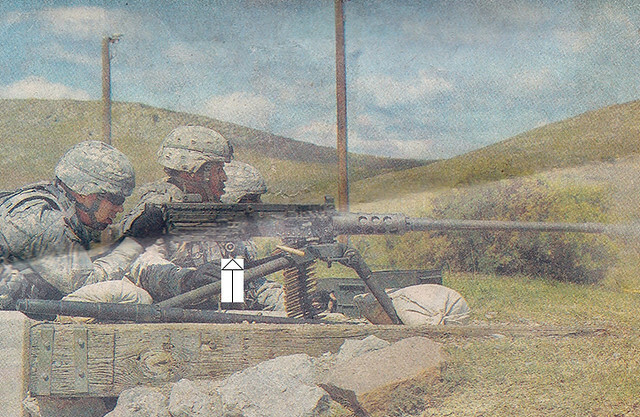 While I was stationed there the post paper (The Cannoneer) published an article about a local active duty unit conducting internal small arms training. Here are some choice quotes. Yes, that is how they described this machine gun. The picture below, which was prominently displayed on the front page above the fold, was scanned from that article (this was on cheap newsprint, hence the poor scan quality.) I added the arrow which points to the Traverse and Elevation mechanism showing that it was mounted backwards. Note that the element I was assigned to at Fort Sill provided small arms instruction on a full-time basis but these active duty personnel never bothered to contact us. We found out about their little training event after the fact via this article. Nothing was mentioned on how much skills were raised, or if they were even measured, in expending “thousands of rounds” through their M-2 “rifles” and backwards-mounted T&E.